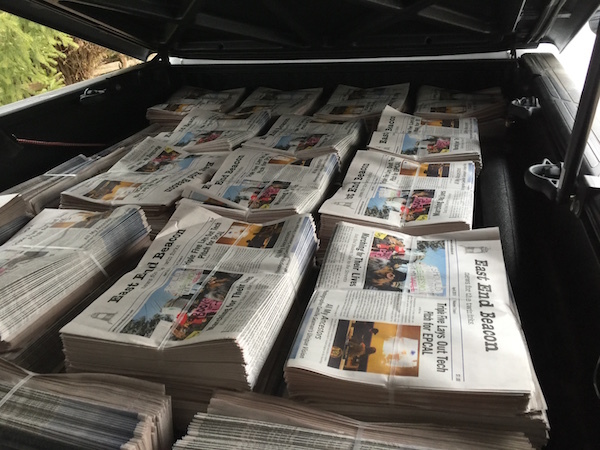 This April’s edition of the East End Beacon marks our one-year anniversary of providing fresh local news, in print, for the whole of the East End. We’ve been welcomed with open arms by readers from Montauk to Riverhead to Orient and everywhere in between, and we are filled with gratitude, every day, for the reception we’ve received. This was a surprise to us — after all, we hear every day that news is increasingly becoming more digitized. But as more and more people we met were familiar with The Beacon precisely because it is now in print, we realized we made the right choice. Now is a critical time in this country, not just for the media, but for understanding just what the American experiment is all about. This country is just 242 years old, a mere baby when compared with most civilizations throughout the world. Our protection of the free press and our collective belief in the importance of public discourse is essential to making that experiment work. But everywhere we go, and this predates our current national predicament, we meet people who are afraid to speak their minds. This is surprising in a country built on the bedrock of free expression. Perhaps this is because we have no assurance that our exchanges will be civil ones. Civil discourse went out the window decades ago. As Spiderman fans know, with great power comes great responsibility. The power to say anything you’d like comes with the responsibility to treat your neighbor’s opinion with the dignity it deserves. This isn’t a responsibility enshrined in our Constitution, but it is one we will find if we spend any sort of time in church or temple or in contemplative practice. It’s a responsibility we face if we’ve ever sat by our parents in their final hours and realized that reconciling our bonds, as human beings, is far more important than winning an argument. Our country has been on life support when it comes to civil discourse for at least two years. We felt the situation becoming more critical as we considered bringing The Beacon to print, and, by the time we launched in April of 2017, it seemed there were many among us who thought it was time to pull the plug and just let this American experiment devolve into chaos. But that hasn’t happened. Instead, so many Americans have taken up the banner of that other part of the First Amendment, freedom of peaceful assembly, and taken to the streets to make their views known. This nation will have no trouble manufacturing the guns we need to arm a well-regulated militia should we ever face a foreign threat approaching our shores, and we will find no shortage of brave souls to fight in that militia. Those who argue that we might need those guns to protect ourselves against our own government are doing a great disservice to the Constitution. Federal officials take an oath of office to “support and defend the Constitution of the United States against all enemies, foreign and domestic.” It seems those words don’t really matter to many who’ve recently taken that oath. But we all also have rights and responsibilities, as citizens. It is up to all of us to not take the bait when we are dragged into a political argument in which there is no room for civility. It is up to all of us to develop the critical capabilities to know when we are being played by clickbait and bots. It is up to all of us to go cast the votes that other Americans have died so we can cast. Nowhere in the Constitution does it say to not feed the trolls. But this is good advice for anyone living in the 21st Century. There’s nothing in the Constitution about AR-15 rifles either, but men and women who’ve served our country, who carried the M4 and M16 into combat, will tell you that the AR-15 can be easily modified to perform the same function as their service weapon. It’s essentially the same gun. And there’s no place for that weapon in a civil society. Find The Beacon on the East End’s newsstands, or subscribe online here. The power to say anything you’d like comes with the responsibility to treat your neighbor’s opinion with the dignity it deserves. This is a very powerful statement and one that we all need to be reminded of. That statement helps to give our nation its special place in the world. We must not lose sight of this. Thank you for stating it so well.